ANDRÉN & KNAPP - STATUES, "Jesus - Occala"
This statue is on the outside wall of Joy Lutheran Church in Ocala, Florida. The congregation wanted to make a statement of their faith to neighbors and people passing by. 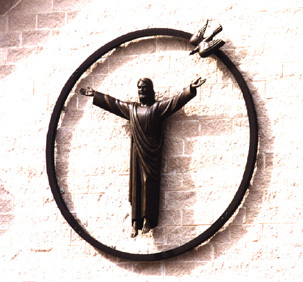 The statue and dove are made of epoxy and fiberglass filled with bronze powder. The circle is of anodized aluminum.